Four-element array coils and high field small animal MR scanners can be used to obtain functional MRI, also known as fMRI, at a high spatial resolution of 75 x 75 x 1000 μm3. The activation area contains fine and detailed substructures, which can be identified at unparalleled in vivo resolution, thereby widening the scope and understanding of the origin and biophysical principles of blood-oxygenation-level dependent (BOLD) to get a better insight into structure and organization of the brain. 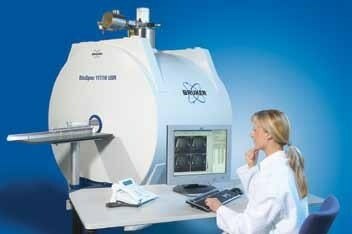 In addition, deficit and recovery of functional brain following stroke and other brain diseases can be fully analyzed. fMRI is used to examine brain activation in both animals and humans and aside from the traditional anatomical MRI, fMRI can give data regarding intactness and function of various regions in the brain and even workflow of information and neuronal pathways between these brain regions. The BOLD effect is nothing but a quantitative technique through which the change of tiny local field disruptions of oxygenated hemoglobin  is measured at high temporal resolution. As a result, EPI sequence is often used to record the BOLD effect; EPI sequence is a rapid sequence that repetitively records the image slices of the rat brain in just 3 seconds or less. However, these EPI images of rat brain are characterized by distortion artifacts and low spatial resolution. With advanced MRI technologies such as fast RF-readout electronics, high magnetic field strengths and multi-element array coils, high resolution functional MRI is now capable of detecting and distinguishing small volumes of activation at even sub-structures scale. 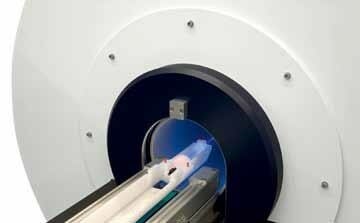 fMRI in small animals can be obtained in magnets from 4.7 to 11.7 Tesla[2,3]. Majority of analyses depend on the stimulation model of electrical stimulation of the forepaw on rats at 9.4 and 7.0 Tesla. Functional activation studies therefore have to be carried out on anesthetized animals. An α-chloralose protocol, the animal has to be kept still and the stimulus has to be simultaneously processed under this anesthetized condition. However, α-chloralose is known to cause severe side effects and hence, it is only used in acute experiments. In these studies, a different but powerful method is employed using the sedative medetomidine. This sedative enables the recovery of animals and thus can be used in line with the longitudinal experiments. Initiation with 1.5 to 2% isoflurane or halothane, gradual exchange against sedative agent. α2 adrenergic agonist medetomidine is the sedative agent. Special attention is paid during the transformation from anesthesia to sedation, to eliminate pain, noise, and movement. A temperature feedback system serves as an extremely handy tool because both sedative and anesthetic affect the auto-regulation of the rat’s body temperature. Finally, a sanitary pad is placed under the animal so that any increased urgency from the anesthetized animal can be absorbed. When the forepaw is electrically stimulated, the thalamus, and primary (S1) and secondary (S2) somatosensory corte are activated. To achieve this, electrical pulses (1–2 mA of 0.3 ms duration, at 6 or 3 Hz) are applied for 15 seconds after a resting period of 45 seconds, repeated 5 times. It takes 5 minutes and 45 seconds for the resultant total scan. BOLD activation is predicted to be 7 mm2 (GE) and 2 to 3 mm2 (SE) with a BOLD contrast of 1 to 3% for the S1 cortex in rats. 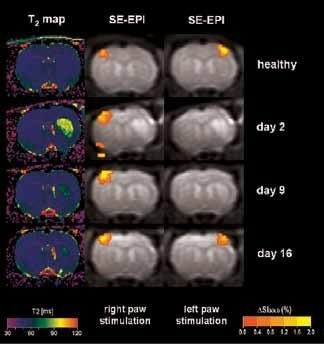 A highly stable method for neuronal activation experiments in rodents is the BOLD fMRI using electrical forepaw stimulation. This method can also be integrated with other imaging methods like perfusion imaging, diffusion tensor imaging, and T2 imaging for lesion depiction. Different resolutions can be obtained based on the equipment, revealing the activation from an unresolved, small cluster to fine sub-structured areas. Figure 1. BOLD activation at 7.0 Tesla on animals after stroke, with a resolution of 400 x 400 x 2000 μm3. T2-maps (left column) indicate the lesion on the right hemisphere. BOLD activation on the left healthy hemisphere (center column) and of the ischemic right hemisphere (right column) indicates transient loss of activation during the first two weeks following stroke, followed by full recovery at day 16. Using older DBX electronics and linear surface coils at 7.0 Tesla, BOLD contrast with 400 x 400 x 2000 μm3 resolution can be obtained. Combined with T2-maps, loss of functional activity and its instant recovery as well as stroke lesion (Figure 1) was defined[4,5]. A combination of faster AVANCE II readout electronics, quadrature surface coil, and higher field strength of 11.7 Tesla increased both resolution and SNR to less than 200 x 200 x 2000 μm3, which is more than sufficient to identify the tiny structures along the neuronal activity pathway like the thalamus and secondary somatosensory cortex S2 (Figure 2) with BOLD contrast. Matrices up to 256 x 256 were obtained with a four-element array coil, resulting in 75 x 75 x 1000 μm3 resolution. The activation becomes more resolved at this high resolution and allows the detection of sub-structures and shape in thalamus areas S1 and S2, as shown in Figure 3. Figure 2. BOLD activation at 11.7 Tesla using the quadrature surface coil with a resolution of (left) 300 x 300 x 2000 μm3 for high quality and (right) 150 x 200 x 2000 μm3 for high sensitivity. Typically, BOLD contrast increases with higher field strength as a result of increased sensitivity. Owing to reduced effects of partial volume, the BOLD sensitivity is further enhanced by increased spatial resolution. When using the quadrature coil, it was observed that BOLD contrast increased from 1.5% at a resolution of 400 x 400 x 1000 μm3 to as high as 4% at 150 x 150 x 1000 μm3 at 11.7 Tesla. Sub-structures can be easily detected at higher resolutions. At such resolutions, BOLD contrast reduced as a result of reduced SNR. However, in these analyses, an instant increase of BOLD contrast with field strength, seen up to 7.0 Tesla (Figure 4). which was no longer observed. This is because of decreasing intravascular contributions as well as decreasing extravascular contributions from arterioles and venules. Short T2 values of blood explain these changes at such high field. Yet, higher S/N is provided by increasing field strength, and when this S/N is invested into higher spatial resolution, it provides access to finer details of sub-structures and at the same time boosts the BOLD amplitude (due to less “dilution” by partial volume effect). Together with recent coil technology and high magnetic fields, fMRI is capable of providing high-resolution images that help detect and differentiate small activation magnitudes and small and highly resolved activation areas on single-shot, high quality EPI images, even at the highest field strength. These results will benefit future studies on animal methods and models, which will provide a better insight into the brain structure and, most importantly, the brain function. Ogawa, S., Lee, T.M., Kay, A.R., Tank, D.W. Brain magnetic resonance imaging with contrast dependent on blood oxygenation. (1990) Proc. Natl. Acad. Sci.,USA 87: 9868-9872. Silva, A.C., Koretsky, A.P. Laminar specificity of functional MRI onset times during somatosensory stimulation in rat. (2002) Proc. Natl. Acad. Sci., USA 99: 15182-15187. Seehafer, J.U., Kalthoff, D., Beyrau, A., Farr, T.D., Wiedermann, D., Hoehn, M.Dependence of magnetic field strength on the BOLD effect using spin-echo and gradient-echo EPI at 7.0 and 11.7 Tesla. (2008) Magnetic Resonance Materials in Physics, Biology and Medicine 21: 326. Weber, R., Ramos-Cabrer, P., Wiedermann, D., van Camp, N., Hoehn, M. A fully noninvasive and robust experimental protocol for longitudinal fMRI studies in the rat. (2006) Neuroimage 29: 1303-1310. Weber, R., Ramos-Cabrer, P., Justicia, C., Wiedermann, D., Strecker, C.,Sprenger, C., and Hoehn, M. Early Prediction of Functional Recovery after Experimental Stroke: Functional Magnetic Resonance Imaging, Electrophysiology, and Behavioral Testing in Rats. (2008) J. Neurosci. 28: 1022-1029. Strupp, J.P., Stimulate: A GUI based fMRI analysis software package. (1996) Neuroimage 3: S607. Smith, S.M., Jenkinson, M., Woolrich, M.W., Beckmann, C.F., Behrens, T.E., Johansen-Berg, H., Bannister, P.R., De Luca, M., Drobnjak, I., Flitney, D.E., Niazy, R.K., Saunders, J., Vickers, J., Zhang, Y., De Stefano, N., Brady, J.M., Matthews, P.M. Advances in functional and structural MR image analysis and implementation as FSL. (2004) Neuroimage 23, Suppl 1: S208-219.